Greek Yogurt, the market speaks for itself. Worth approximately $6 billion in the United States with sales rising 100 per cent in each of the last three years, Greek yogurt is dominating the food industry. Continuing growth for this product is no doubt attributed to its inherent health qualities— namely the doubled protein content and high source of calcium that ensures muscle and bone development—and its creamy taste. Taste is a Baby Gourmet guarantee. So when samples arrived at my door, when I squished the delicious contents in a bowl and got out two spoons - a table one and a toddler one. Greek Yogurt Smoothie. She ate the entire package (save a few stolen spoonfuls), while saying "Numa, numa, numa!" the entire time. Hannah speak for "More please, more please, more please!" I found it extremely delicious too. The packaging makes for easy eating on the go, but I wonder if Hannah would share. Jennifer Carlson, founder of Baby Gourmet, and a mother understands why healthy eating is so important and inn her commitment to make eating on-the-go convenient and delicious as well as nutritious. 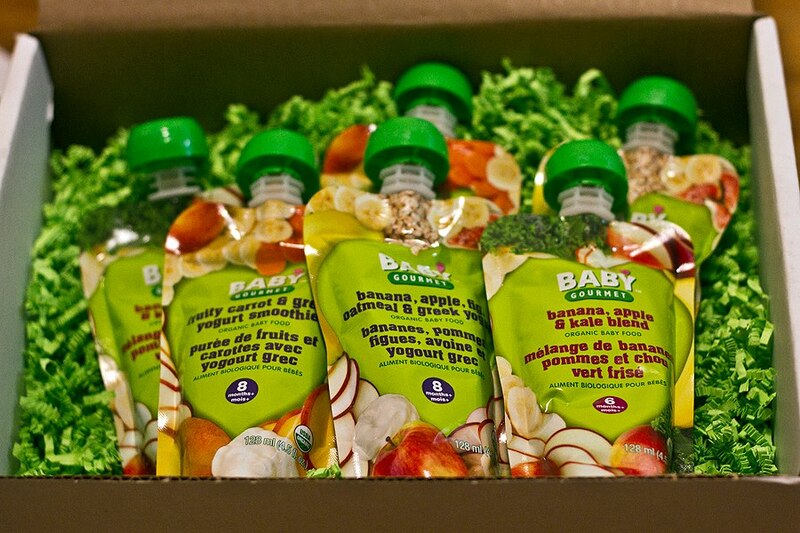 One lucky YYZ Bambina reader can win a Baby Gourmet sample pack including the new flavours! Open to Canadian (excluding Quebec) Residents who are the age of majority only. Valid entries only. Contest ends Wednesday, April 24, 2013. For further contest rules, refer to the Terms and Conditions within the Rafflecopter. 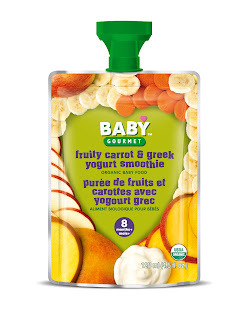 Disclosure: I received samples of Baby Gourmet for the purposes of this review. As always, opinions on this blog are my own. The Cherry Apple Blossom sounds great! Banana Apple Kale Blend - anything to get them to try kale! We've actually tried all of them already... my son particularly likes the Banana, Apple, Fig, Oatmeal & Greek Yogurt. He loves the banana apple kale as well. Banana, Apple, Kale Blend. My daughter loves kale chips so this is another great way for her to eat her greens! Cherry Apple Blossom, sounds yummy. I think it's great that kids can be introduced to flavors like kale and beets early on. Sets great eating habits. Minty pears, apples and peas sounds great. Banana Apple Kale Blend - anything to get them to try more kale! We've been trying them already but need to get my hands on the banana apple kale blend! My daughter really likes these and it's a good alternative when I don't have homemade food for her! These look delicious! I wish they had more of these options when my kids were younger. Why not here in quebec!?! We love this stuff! My daughter loves the minty pears, apples and peas! I'm most interested in trying the Banana, Apple, Fig, Oatmeal & Greek Yogurt. We've tried most of the new flavours and my son loves them all! His favourites are the Banana Apple Kale, and Minty Pears Apples and Peas. We are new to this food and so far am very excited that it exists, 6 years ago with my first it did not! Great job! We are excited to see that this product exists, this is my second baby and there were not alot of good feeding options with my first, 6 years ago. Also excited it's a Canadian company! My daughter inhales the Fruity Carrot & Greek Yogurt Smoothie. Can't say enough good things Baby Gourmet. I would like to try the Banana, Apple, Fig, Oatmeal & Greek Yogurt!